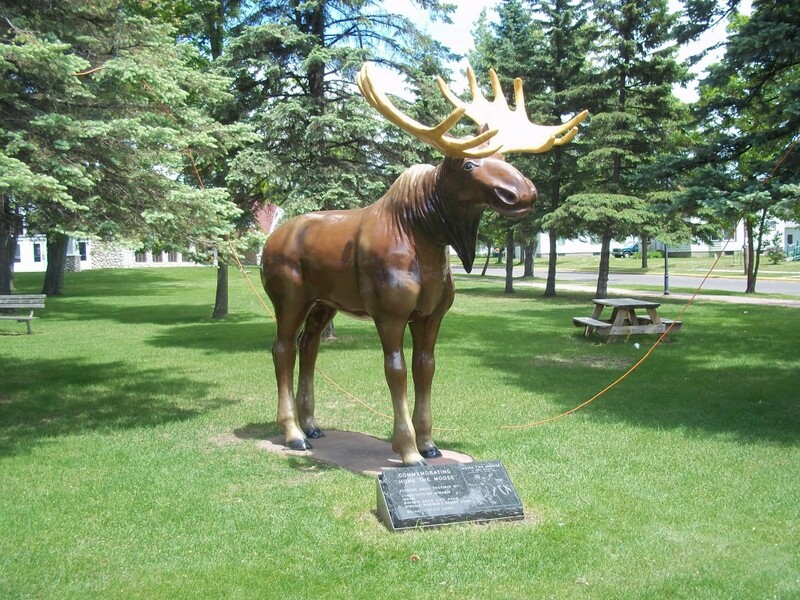 Honk the Moose is a statue of a life-size moose in the Iron Range town of Biwabik, MN. The moose is a depiction of a real life moose who made his winter home in town during the winter of 1935. He stands in a city park in the middle of town, easily visible on the main drag. A book was written by about the moose, simply titled “Honk The Moose.” As the story goes, back in 1935 a moose wandered into town and was first seen in a livery stable near some horses chomping on their hay. He was commonly seen moseying around town that winter and eventually took on the moniker “Honk” because of the noise he would typically make. The townspeople eventually took him in as thier own and they all lived happily ever after. The book was written by Phil Stong, with illustrations by Kurt Wiese. The book went on to be included on Cattermole’s 100 Best Children’s Books of the 20th Century list and was a runner-up for the 1936 Newbery Honor Award. It won the Lewis Carroll Shelf Award for the illustrations in 1970. It’s recognized as a children’s classic and the people referenced in the book were based on real folks and many of the buildings in the book are still standing. 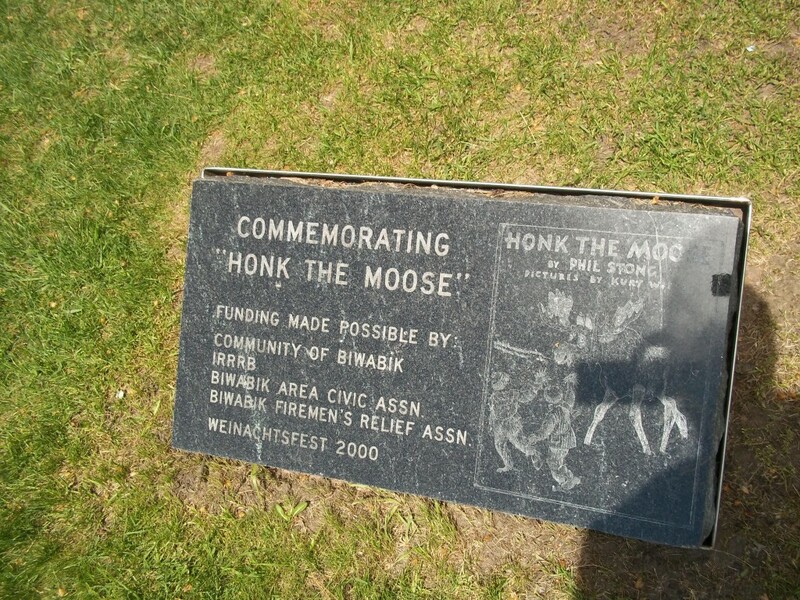 In the year 2000, Biwabik finally ordered and installed a big fiberglass moose in the town square, commemorating Honk. Biwabik is a very cool little Scandinavian/Bavarian town that’s worth a stop. I put it on my list of coolest small towns in Minnesota, and a recent trip back through it, only confirms it. While in the area: Giant’s Ridge Ski Area is only a few miles away, which offers great summer and winter activities. And the Boundary Waters aren’t far away either. 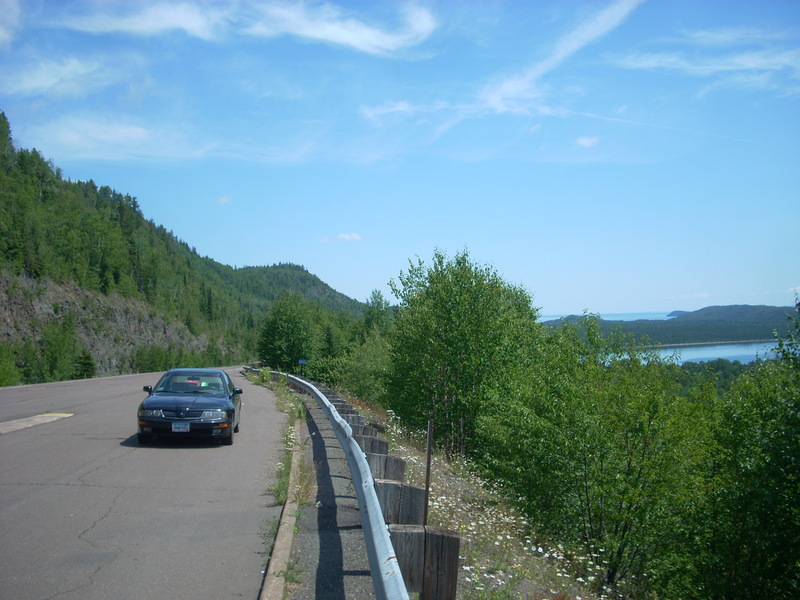 This entry was posted in Highway Highlights and tagged Biwabik, Iron Range, MN, Moose, Roadside Attraction by Seth5544. Bookmark the permalink.